I’m obsessed with pumpkin can you tell? I just LOVE this time of year for that reason. And I am a little obsessed with cream cheese. Combine cream cheese with pumpkin and a few amazing ingredients to get a delicious truffle. My little one Luke, loves to help in the kitchen. He told me when I die, he will take over the blog. I’m so glad I’ve got that covered! He is always trying to create different recipes. We tried gum ball soup but he said it was gross and wasn’t good material for the blog. Besides helping me cook and create recipes, he loves to help style the shoots. 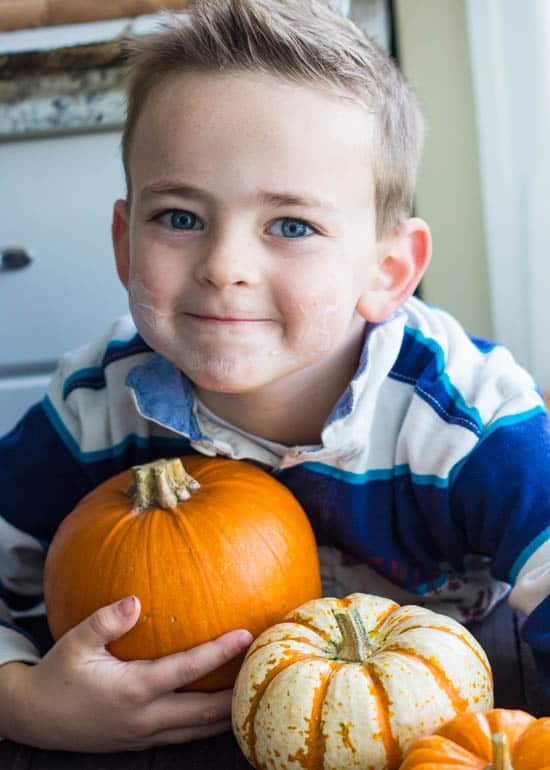 In this particular shoot he lined up all of the pumpkins for me. While he was helping me with the shoot he had a new recipe idea for the blog. Graham crackers with white chocolate on the top. Notice his face in the picture already took a bite out of his delicious creation. In case you are wondering, this is how you make it according to him. 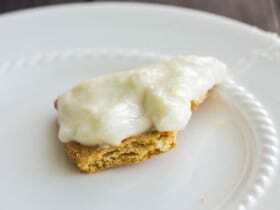 You take a graham cracker bottom and scoop the white chocolate on the top and microwave it for 20 seconds. This is what it looks like. With a bite taken out of it of course! He is so much fun and I love my little helper in the kitchen. And you know that these truffles totally turned out amazing. You can’t go wrong with any of the ingredients and then they are surrounded by white chocolate. These are sure to be a hit! 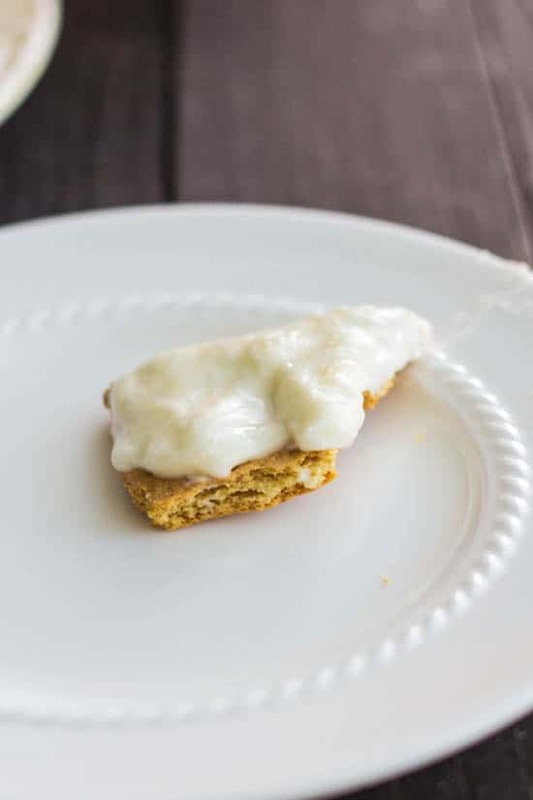 A delicious no bake truffle that is combined with pumpkin and cream cheese! In a large mixing bowl or kitchenaid mixer with paddle attachment, combine gingersnap crumbs, pumpkin, graham cracker crumbs, sugar, cinnamon, salt and cream cheese and beat until smooth. Melt ½ cup chocolate chips in microwave every 30 seconds, stirring so that it doesn't burn. Add the melted chocolate and combine with mixture. Cover and chill for about 2 hours until it is solid enough to roll into balls. Line a baking sheet with parchment paper and roll one heaping teaspoon of the mixture into balls. Melt the remaining white chocolate and drop the balls in the chocolate using a spoon to coat. Lift the truffle out of the chocolate and place on the parchment paper. Garnish with additional gingersnap crumbs and graham cracker crumbs if desired. Chill truffles for about 30 minutes until chocolate has set. Refrigerate remaining truffles. Graham crackers and white chocolate. That’s what I’m talking about 🙂 – Yum! The truffles look awesome too. 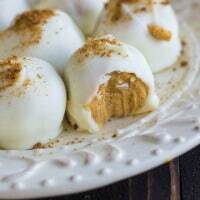 Your recipes look yummy and I can just taste them-) My husband is going to love the pumpkin cream cheese truffles! Thank you for sharing! He is so precious! He looks just like you! Ok, he is seriously the cutest!! And I love that he wants to be in the kitchen with mama. I’m pretty sure I could devour a dozen of these – yum! These look soooo good! I’m loving all the pumpkin recipes everywhere this fall! Omg yor little guy is so cute!!! These truffles look amazing, I can’t wait to try them next weekend! 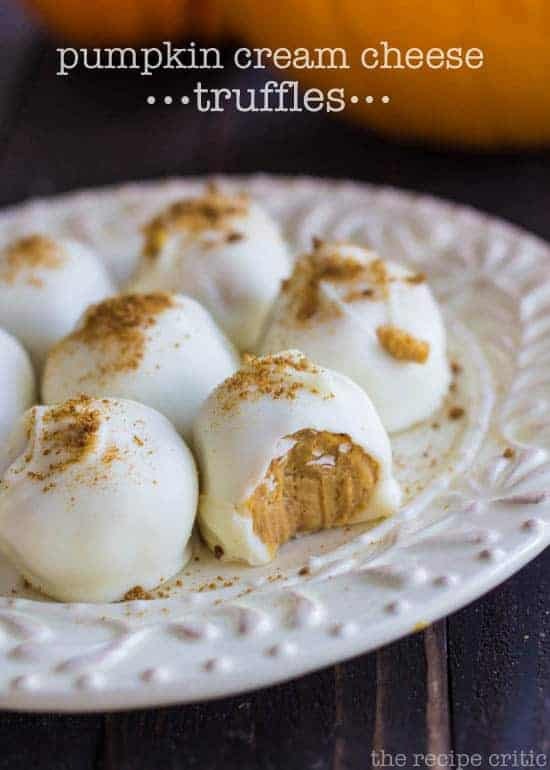 I want to make these for Thanksgiving…do I have to use pumpkin puree or can I use pumpkin pie filling? I’m experienced in the baking world, but have never even attempted pumpkin desserts. 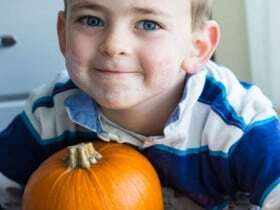 Want to try this for Thanksgiving..do I have to use pumpkin puree or can pumpkin pie filling be used? I bought all the ingredients for these and plan on making them for thanksgiving with the family, but my hands are a little full with an 8 month old, so would love to get a head start. Any idea how these freeze? I’m making these right now. Are u sure the measurements are correct? There seems to be too much dry ingredients compared to wet. And my mixture is very dark and solid. It doesn’t need refrigerating to roll into balls. Question – this says it serves 12, but how many truffles does this recipe make? Thanks! I was able to get about about 12 truffles. Thankyou so much for sharing the recipe! I just made these last night to give away to my friends and teachers as xmas gifts. They look fantastic and were super easy to make. Really delicious! Thankyou! The on-screen recipe calls for 1/2 cup of ginger snaps; the print version calls for 1 1/2 cups which seems like an awful lot. Which is it supposed to be? These look amazing! I love pumpkin anything all year round and can’t wait to try these out. These truffles turned out alright but are more like a gingersnap truffle. When I made them they did not look like the photo at all. They were much darker. If you will look at the ingredients, ginger snap cookie crumbs is the main ingredient. I really want to make these. One question….The ingredients list shows ½ cup white chocolate chips and 2 cups white chocolate chips (almond bark will also work). Why is the same ingredient listed twice with different amounts? Where is my brain this morning? Never mind. Guess I should have read the instructions more closely. Now I know. Gingersnap cookie crumbs? Where do you find those? I haven’t seen them anywhere.. They should just be on the cookie isle and they sell them year round… Hmmm substitutes… I have made truffles before with oreos. You might be able to try these with crushed golden oreos but not sure. Bree, just get gingersnap cookies and make the crumbs yourself. Food processor does it really fast. You can also put them in a ziploc bag and use a rolling pin to crumble them. Do you think it would be ok to sub graham cracker crumbs for the ginger snap? I’m about to make these and sub graham cracker for ginger snap. I’m also going to use pumpkin pie spices instead of just cinnamon. I’m hoping they will taste more like pumpkin pie than ginger snaps. i will be making them again tomorrow night so they’ll be ready for Thanksgiving. Super yummy!! Truffles are great. Next time I will be sure to mix all dry ingredients together and all wet ingredients together then combine. Recipe would read easier if ingredients & the order in which they are to be combined agreed. I just made these today. Delicious!